The Addison Park District offers summer day camps to children from preschool to 8th grade. Camps are offered for 11 weeks over the summer, June 3 - August 16. The four camps that the Addison Park District offer are: Tiny Tots Camp, Sports Camp, Kids Camp and Adventure Camp. • In 2019, all camps will be located at Community Rec Center. • Camp dates are June 3 – August 16. Each camp session is one week. • Regular day camp runs from 9:00 a.m. - 4:00 p.m.
• You must register for weekly camp programs by the Friday prior no later than 5 p.m.
• First-time camp participants must provide a certified copy of the child’s birth certificate at time of registration. • All participants must bring a sack lunch and drink each day unless notified. 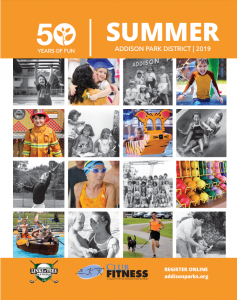 • Summer day camp manuals and emergency forms are available on the Addison Park District website or at Community Rec Center. your child’s name on it. Call (630) 233-7275 to learn more!